We’ve just begun the second volume of Susan Wise Bauer’s Story of the World. My original plan was to complete one volume each year. We would begin in first grade and make our way through history from the ancients all the way to our current times in a four year cycle as out lined in The Well Trained Mind (I love that book!). SOTW however, is 42 chapters long, and with a move, a pregnancy and a new baby all during the “school year” we didn’t complete it until just before Christmas. And we school year round. So while we will be studying history in chronological order, I doubt we will cover it in 4 years. At this rate, it will be more like 6 years! History is the most favoured subject around here though, so we don’t want to miss a thing. Story of the World is really a great curriculum – it can be as simple or in depth as you want it to be depending on the age, maturity or interest of your students. For a very simple, story based approach, the text could be read chapter by chapter. We typically read one chapter a week and complete the review questions section by section. Then my daughter narrates each section to me as I write it down, and then she illustrates it. The activity book also presents so many options to take your learning to deeper levels. To continue with a simply book/literature based approach, the activity guide provides extensive book lists for further historical or literature reading. To incorporate geography, use the maps and mapwork provided. There are also numerous colouring pages to give little hands something to do while you read the chapters or the supplemental reading listed. For fun, and to help the children “experience” history, there are also numerous activity suggestions some of which require special supplies (such as building clay tablets, making your own papyrus or mummifying a chicken) or everyday things you already have (building a pyramid out of legos). There are even recipes and costume suggestions so your family can experience an African/Indian/Monk’s feast. I must confess I haven’t done any of the more exciting suggestions due to my own laziness. This year I purchased the recommended colouring book A Coloring Book of the Middle Ages which I think will be well received by my girls. I also bought The Usborne Encyclopedia of World History (internet linked) which I wish I had last year when we were doing the ancients. We’ve already used some of the links and my oldest has really enjoyed the online history crossword puzzles listed there. 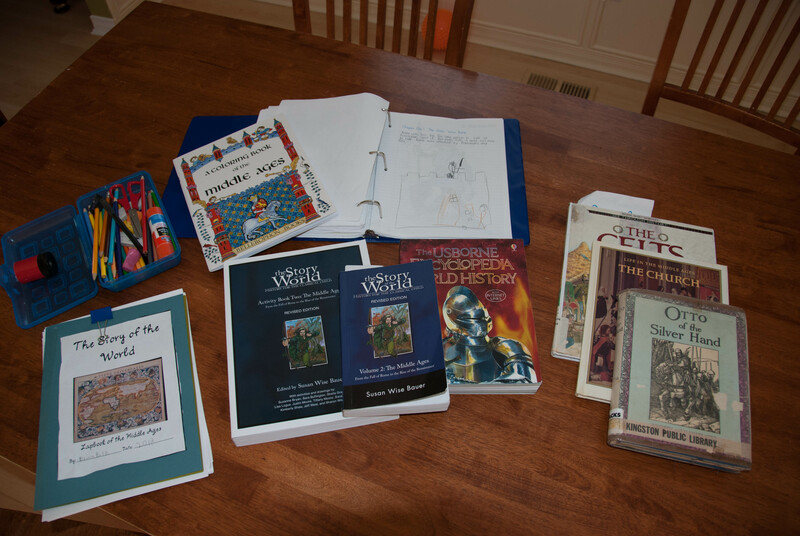 A final addition to our SOTW history studies this year is the lapbook I found online. Lapbooks for all four volumes are available from the blog Carrot Top x 3 It doesn’t require very much work on the part of my second grader, but it will give her something to cut, colour and glue while I’m doing read alouds. We are really looking forward to learning all about the middle ages this year using the above mentioned resources, and I’ll be sure to post updates and pictures of our learning as we go along! I’m getting so excited to jump back into Story of the World with my little guy next year! Thanks for stopping by, and welcome to the rewards and challenges of homeschooling 🙂 I’m not familiar with Story Book Cubes (I’ll have to google that!) but I’ve heard good things about Life of Fred! For classical education, there are many good books and websites available to help with curriculum selection, my favourite being The Well Trained Mind. You might wish to check out the forums available on their website as there are many homeschooling moms there with experience in starting classical education “late”. We are loving First Language Lessons and Writing With Ease, but I’m not sure how to determine what level to start at if not starting at 1st/2nd grade. Good luck to you and have fun!